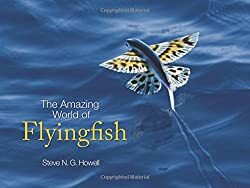 Steve N. G. Howell’s The Amazing World of Flyingfish plays with the concept that eveyone “knows” about flyingfish as a way to highlight the huge gaps in our knowledge about these iconic fish. Those areas of ignorance can have dramatic and direct impacts on conservation and sustainable fishing issues. At its heart, The Amazing World of Flyingfish is a book of pictures – beautiful and hard-won pictures (photographing flyingfish in flight is apparently, but not surprisingly, challenging). The images are not just aesthetically pleasing. They serve Howell’s major theme, contrasting the known with the unknown. On one hand, flyingfish are common and well-known. On the other hand, we do not necessarily know that much about their life history, development, or how many species their really are. Howell uses this contrast between the known and unknown to discuss different aproaches to research. The benefits of briefly viewing live animals behaving in their natural environment are compared to detailed laboratory analyses of preserved specimens in a way that shows the value of both approaches. The problems posed by limited knowledge of species identity for conservation and sustainable fishing are discussed with a thoughtful approach to the value of common usage versus scientific naming. And, if those issues do not interest you, the book is filled with over 90 gorgeous photos of flyingfish in action, revealing aspects of these animals that were entirely new to me. The dynamic of known versus unknown played out when my six-year-old joined me in looking over this book. The beauty of the images and the name “flyingfish” immediately captured our attention. Then we got curious. As I am not an expert in flyingfish, fish, nor any set of multicellular organisms, that meant we were rapidly going to bump into the familiar territory of “things to which Daddy does not know the answer”. This is fun territory, because we get to go on the journey from “not knowing” to “knowing” together. We asked the question, “Do they really fly?” We learned that you cannot answer such questions with a simple “yes/no”. We first had to decide what we meant by “fly”. We were learning about the process of asking and answering questions. When Howell discusses the difficulty of pairing juvenille specimens with adults in terms of species identity, we talked about physiological changes in appearance during development and the expectation that her own body would change as she grew. One image, however, did not draw us in. The altered image of a human-sized, trophy-style flyingfish confused and distracted. Instead of discussing the fascinating biology of flyingfish, I had to explain that the huge fish was not real, the ethics (or lack thereof) of trophy fishing, and Photoshop. The worst effect was that it planted a seed of doubt about the veracity of the book’s other photos in my child’s mind. Nothing, for us, could compate to the realization that some flyingfish have butterfly-like patterns on their transluscent wings/fins*. Howell connects this delightful discovery to the larger problem of species identification, which is vital to conservation efforts. Apparently, the patterns do not survive the preservation of specimens, leading to a divergence in what one sees in the wild and what is analyzed in the laboratory. For Howell, the species identification problem cascades into many unknowns regarding flyingfish life history, population sizes, distribution, and seasonal variation. For us, the conversation started by those beautiful wing patterns touched on the importance of different people with different interests and experiences communicating with each other. We even talked about what we can do to build knowledge when no one know the information we need. In other words, we can draw a direct, curiosity driven line between that image of yellow and black spotted flyingfish wings/fins* that you can see above and reinforcement of the scientific method. Not bad for a book with only 45-pages in it. *I was informed by my precocious offspring that I am not allowed to call them “fings”. DISCLOSURE: Josh Witten was provided with a review copy of The Amazing World of Flyingfish by Princeton University Press. Princeton University Press had no input or influence over the decision to review this book or the content of this review. This entry was posted in Curiosities of Nature and tagged Book Review, flyingfish, parenting, Princeton University Press, Steve NG Howell. Bookmark the permalink.